They Heat Exchangers are designed to be robust to withstand all conditions, specifically at the point of loading impact. Owing to perfection and quality oriented approach, we have carved niche in the industry by offering an enormous grade array of Heat Exchanger. Shell & Tube Heat Exchangers are most commonly used in almost all industries like- Refineries, Chemical plants, Fertilizer plants, Genset units, Oil & Gas and Shipping. Typical use of Heat Exchanger is to cool or heat the fluids or gases. We provide almost all TEMA type Shell & Tube Heat Exchangers. We also supply Duplex Coolers, Shell in series and shells in parallel type heat exchangers. Tube Material Copper, Steel, Brass, M.S. 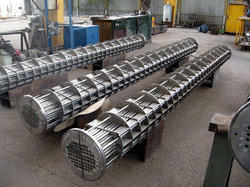 We at ADITYA ENTERPRISE in AHMEDABAD offer world class heat exchanger particularly shell type. We offer all types of shell and tube heat exchanger for all industrial applications. where ever the pressure and temperature is available its required our heat exchanger. In heat exchanger industry the most important type of usage in oil industries ,chemical process, Textile Industries, Pharmaceutical industries, Plastic industries etc,. This shell and tube heat exchanger having two parts. One is Shell side and another one is Tube side. U Tube Bundle Type Heat Exchanger. During the manufacturing process industries are in need of heat exchangers to transfer or the heat by using many types. 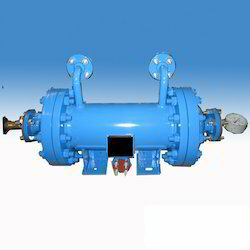 The shell and tube heat exchanger is specially design and suites for higher-pressure applications. We provide the entire array in different sizes and technical specifications. In order to ensure the quality of this heat exchanger, our skilled professionals perform a series of test against various parameters. Intercoolers and Aftercoolers are used to cool high pressure gas from compressors in order increase compressor efficiency and provide the gas at the point of application at the required pressure and temperature. All intercoolers and aftercoolers are designed and manufactured to be complaint with ASME Sec VIII Div 1. Fins coated with phenolic coating to ensure protection even in saline atmospheres. Helium Leak Tested by Vacuum Method (0.1 mbar; Helium on shell side) and passed with a leak rate of 10-8 std cc/sec. With sincerity and hard work of our professionals, we have carved a niche for ourselves in this domain by offering wide gamut of Shell & Tube Oil Coolers. We hold expertise in offering Shell & Tube Oil Cooler of optimum quality. Our range of equipment also includes Shell & Tube oil cooler and heat exchangers, which are fabricated using qualitative raw materials. Known for its reliable performance and durability, our range is offered in tailored solutions to serve the requirements of our clients. Our company is well known in the market and they have been made using the best technology available in the market. The range of products which we offer to the customers are inclusive of the Shell and Tube Oil Coolers which transfer the heat in a very effective manner and these coolers are high on demand in the marine sectors and in the diesel engines. These products have been priced at very reasonable and affordable rates in the market. To meet the diversified requirements of our prestigious clients, we are engaged in offering Intercooler Heat Exchanger that is effective in cooling compressed air or gas to reduce their volume or temperature. Material of Construction Copper, M.s. We do supply the same heat exchangers in different material like Copper, ss 304, ss 316 and ss 316L. We Supply The Replacement Inter Cooler For Atlas Copco Make Rotary Screw Oil Free Compressors For Their Various Models Like Zr, Zt Etc.